Richard Deacon, Fold 2012. Photo: L Dawkins, Tate Photography © Richard Deacon. 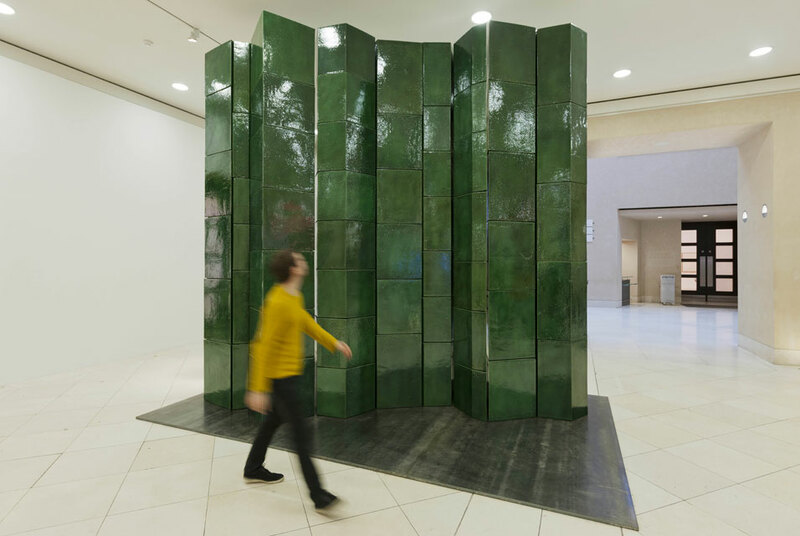 LONDON.- A green ceramic sculpture weighing over 12 tonnes and standing 4 metres high was unveiled in Tate Britain’s Manton Entrance today. Fold 2012, by one of the UK’s leading artists Richard Deacon (born 1949), went on display to mark the opening of the largest survey of Deacon’s work in London for around 25 years. This is the first time Fold has been on display in a public gallery, and the first time a sculpture has been displayed in the Manton Entrance. The exhibition opens at Tate Britain on 5 February. Richard Deacon’s Fold 2012 is a towering sculpture in glazed ceramic. From a distance the nine closely clustered towers look like a freestanding folding screen. Closer inspection reveals the sculpture to be made of sixty irregular bricks which appear to shift and shimmer as the viewer walks by. The sculpture demonstrates Deacon’s interest in the relationship between components and the whole. This is a theme further explored within the exhibition itself, which surveys Deacon’s work from the 1970s onwards. Richard Deacon said: It’s wonderful that I have been given the opportunity to show such an ambitious work at Tate Britain. I’ve always thought of it as more of a gate than a barrier and we’ve placed it in the space between the entrance to and the exit from the exhibition, which is also in the area the public circulates. The work joins the beginning and the end with a fold in the middle. You could almost call it a hinge. Clarrie Wallis, Curator, Tate said: We are delighted to be showing Richard Deacon’s Fold 2012 in the entrance of Tate Britain. Fold 2012 is the largest freestanding ceramic work Deacon has ever made and it is characteristic of his ambitious approach to making art. This monumental work highlights how Deacon’s practice is continually evolving and how the challenges he sets himself grow from the nature of his materials.